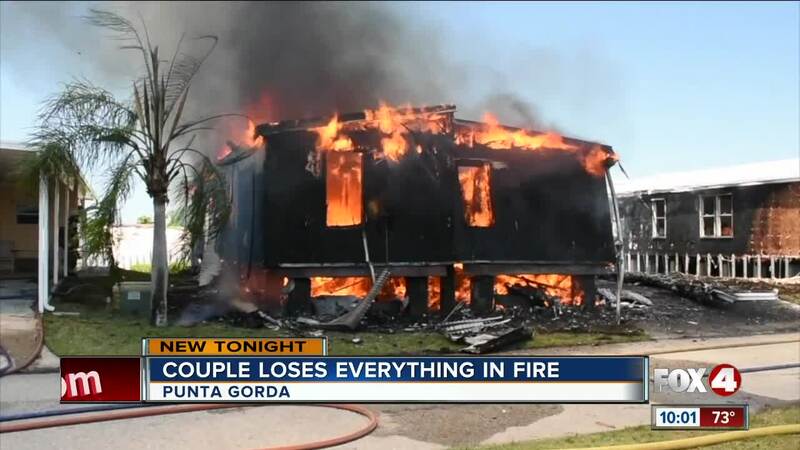 PUNTA GORDA, Fla. — Laurie Ross and her husband David narrowly escaping with their lives — after a fire ripped through their home. It burned down their house on Windmill Boulevard and Edam Street in Punta Gorda Monday afternoon. Ross said she can’t believe all of this is real. “It’s like I’m having a nightmare,” she said. The Ross’s lost the only home they’ve known for the past 18 years. She said she and her husband followed their first instincts to stay alive. She described being inside their home and her husband was outside when they noticed the fire. Charlotte County Fire Battalion Chief Michael Seneca said this was a fast moving fire, spreading to the home next to it. “It seems like the fire spread from the original fire structure to the attic space here a little bit. So, we basically had two working structure fires at the same time,” he said. The side of one neighboring home is completely charred and has significant damage inside — the owners are out of town. While the other neighbor has some damage on its side panels. The fire department said the person who lives there won’t have electricity at least for tonight. And the Ross’s who lost their home permanently will spend the night at a friend’s house. She said neighbors have offered everything from their homes to clothes to food and money. The state fire marshal is investigating the cause of this fire. But the fire department said as of now no suspicious activity has been reported.